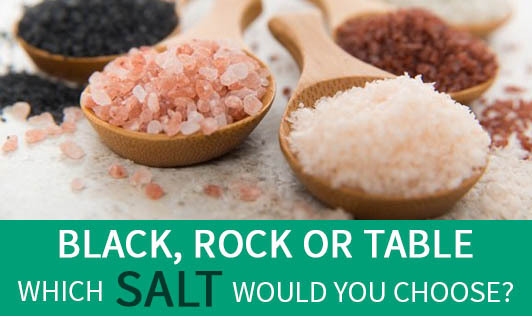 Black, Rock, or Table- Which Salt Would You Choose? Salt is an indispensable part of Indian cooking, and yet has to be used so sparingly to avoid health problems. It is available in different varieties like kala namak, sanchal, sedha namak, and rock salt. Are they the same or are they different, and can they substitute common salt? Rock salt, commonly known as sendha namak is actually Halite, the mineral form of sodium chloride (NaCl). It is generally colorless or yellow in color but depending on the amount of impurities, it could also be light blue, dark blue, or pink in color. As the name suggests, rock salt is derived from salt deposits. It is a large crystalline form of salt and is basically the mineral sediment leftover of the crystalline material present in salt lakes and sea water. Mined rock salt is then refined and converted to table salt and commercially sold for human consumption. It is used to flavor chutneys, raitas, and savory dishes. In Ayurvedic medicine, it is used as a laxative and a digestive aid. It is used in ice cream-making machines as it reduces the freezing point of water. It is believed to be beneficial for people suffering from arthritis. Black salt, commonly known as kala namak or sanchal is a type of Indian volcanic rock salt mined in Central India. It is a dark, almost black colored crystalline salt, which turns into a pinkish grey powder once ground. It consists primarily of sodium chloride along with other minerals, iron, and sulfur compounds. The pinkish dark color is due to its iron content and the sulfur compounds give it a distinctive sulfurous smell, similar to that of hard-boiled egg yolks. The sodium chloride is responsible for its salty taste. It is used extensively in Indian cuisine to flavor chaats, raitas, fruits, and salads. It is one of the main ingredients in commercially available chaat masalas. During the summer season, it is also used to flavor cold drinks, which is a practical way to replace sodium lost through excessive perspiration. It is used extensively in Ayurvedic medicines to treat problems like indigestion, flatulence, and heartburn since and is considered as a cooling spice. It is used as an ingredient in Ayurvedic toothpastes. Are rock/black salt better than table salt? In India, sendha namak or kala namak, is believed to be better than common salt for people with hypertension and chronic kidney disorders, since they have a lower percentage of sodium chloride as compared to common salt. However, what is important is that rock salt is basically more than 85% sodium chloride. Also, it is less salty than common salt, so in order to get the same taste, more rock salt would have to be used, which makes the sodium consumption almost the same as that of table salt. Therefore, it should not be used as a substitute for common salt in conditions where sodium restriction is suggested. Similarly, kala namak is also sodium chloride, with additional minerals. Its composition depends on whether it is manufactured using traditional or modern techniques. Synthetically prepared black salt has sodium content very similar to that of common salt. Also, rock salt does not contain iodine which is required for thyroid regulation, whereas, table salt is fortified with iodine. So logically, substituting common salt with rock or black salt is not required unless one wants to reap the benefits of the additional minerals available in the latter.